Q: According to Reuters, an US official said on July 13 that the Trump administration is losing patience with China and likely to announce new sanctions on China's small banks and companies engaged in business with the DPRK. How do you comment on that? A: I don't know whether this report is true, or whether the relevant US official said this under the authorization of the US government. China has been implementing the UN Security Council's DPRK-related resolutions in a comprehensive, strict, accurate and faithful manner. Meanwhile, we oppose the imposing of unilateral sanctions outside the framework of the Security Council, especially the so-called "long-arm jurisdiction" by any country based on its domestic law. For a long time, China has been making unremitting efforts to resolve the Korean Peninsula nuclear issue, and played an important and constructive role. As a permanent member of the Security Council, China has actively participated in the consultation of a series of the Security Council's DPRK-related draft resolutions and supported the adoption of relevant drafts. 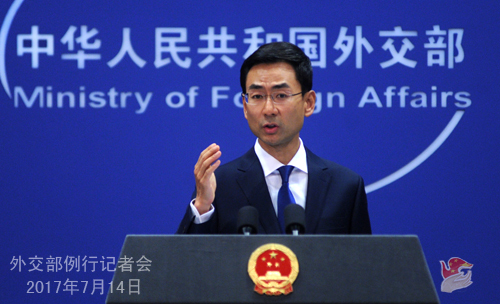 Relevant country asked China for help and cooperation before the draft is adopted, but after the adoption, it is going to impose unilateral sanctions on China. Isn't it tearing down the bridge after crossing the river? We have said on multiple occasions that the settlement of the Korean Peninsula issue calls for collective wisdom and coordinated efforts of various parties. We hope all relevant parties can work for the shared goal and make efforts to bring back the Korean Peninsula issue to the right track of peaceful settlement through dialogue and negotiation. To conclude, I would like to make it clear that what China is implementing is the Security Council's resolutions rather than certain country's domestic law. Q: On July 12, the Attorney's Office of the Central District of Illinois issued a notice saying that based on facts presented in court and relevant court documents and other facts uncovered during the ongoing investigation, the US law enforcement department decided the missing Chinese scholar Zhang Yingying was deceased. How do you comment on that? A: We have noted relevant reports. We are deeply shocked and saddened by the tragedy of Zhang Yingying and convey our deep condolences to her families. The Chinese government highly values the security and lawful rights and interests of overseas Chinese nationals. 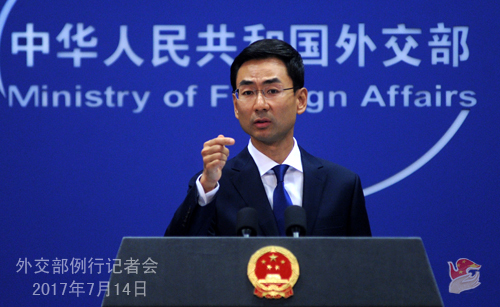 China's Ministry of Foreign Affairs and diplomatic missions in the US will continue to closely follow the development of this case, stay in close communication with the US side and coordinate with the US police to intensify all-out efforts for search and investigation. China strongly hopes that the US judicial department will hear this case impartially in accordance with the law, hold the perpetrator accountable and uphold justice. We will continue to provide assistance to the families of Zhang Yingying in handling relevant affairs in the US. Q: The Indonesian government has released a new official map of Indonesia that renames a part of the South China Sea as the North Natuna Sea. The area includes Indonesia's claimed exclusive economic zone that is intersected by China's nine-dash line. Have you seen this new map? Have you expressed any concern to the Indonesian government? A: I am not aware of the details you mentioned. But I have to stress that for a long time, as an international standard name of a geographic entity, the term "Nanhai" and its standard English name "South China Sea", refer to a clear geographical scope, which has been widely recognized and accepted by the international community, including the United Nations. The so-called change of name makes no sense at all and is not conducive to the effort to the international standardization of the name of places. We hope relevant country can work with China for the shared goal and jointly uphold the current hard-won sound situation in the South China Sea. Q: There are reports that Germany has tightened its rules on foreign corporate takeovers of its strategic enterprises. This can allow the government to block takeovers if there is a risk of technology being lost abroad. Germany will work together with France and Italy to make similar adjustments to the EU law regulations. The report said the rules are a response to concerns that the IPR will be lost because of China's takeover of European and German hi-tech companies. How do you react to that? A: We express concern to relevant moves of Germany and the EU. We have said many times that the nature of the economic and trade cooperation with Germany and other countries is mutually beneficial and win-win. In recent years, the positive progress in China-Germany and China-EU economic and trade cooperation has been there for all to see, and brought tangible benefits to their enterprises and peoples and promoted their own economic developments. In the current international situation, China stands ready to work with Germany and the EU to promote trade liberalization and investment facilitation on the basis of mutual respect and treating each other as equals, and in the principle of mutual benefit, win-win results and common development. We hope that, when introducing relevant measures, Germany and the EU can avoid being affected by protectionism and sending chaotic and negative messages to the outside world. Q: The office of the President of Botswana announced Thursday that the president will meet with Dala Lama during his visit to the country next month. What is China's response to this? How will the visit affect China's investment in the country? A: The 14th Dalai is a political exile who has long been engaged in anti-China separatist activities under the cloak of religion with the attempt to split Tibet from China. 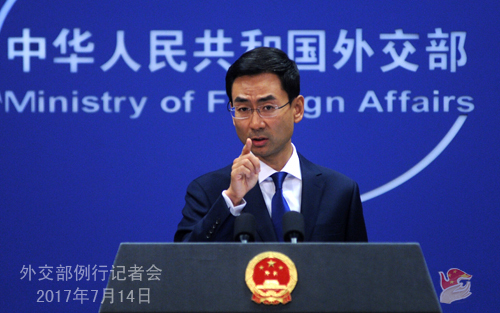 China is firmly opposed to Dalai's trip to any country for activities aimed at splitting China in any capacity or name, and contact with any official in any form in any country. China's stance is clear. We hope relevant country can see clear the nature of Dalai, faithfully respect China's core concern and make correct decision on the relevant issue. Q: Yesterday Tsai Ing-wen tweeted that she was honored to receive Paraguayan President Horacio Cartes on his so-called "state visit" to Taiwan and the two sides inked new agreements on economic cooperation and visa-free travel for tourists. How do you comment on that? A: The one china principle is the general consensus among the international community. Any attempts to create "two China" and "one China, one Taiwan" will certainly meet firm opposition of all Chinese people, and it is not in line with the fundamental interests of the Taiwanese people. We hope the Taiwan authorities can make a correct assessment of the situation and return to the 1992 consensus as soon as possible, and do no more things that are against the trend of the times and the will of the people. Q: As far as the 100-Day Action Plan is concerned, there has been criticism that China has been too slow to open up market access for foreign firms. What is your response? 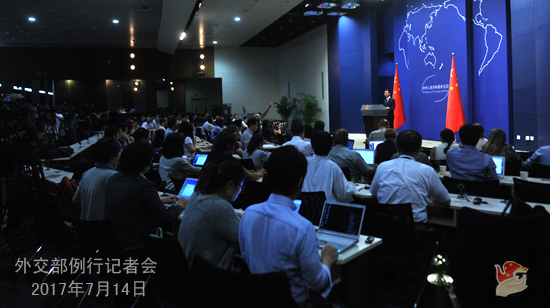 What is your expectation for the upcoming China-US Comprehensive Economic Dialogue? A: Since the meeting of the Chinese and US heads of state at the Mar-a-Lago resort, the two sides have vigorously advanced the 100-Day Action Plan for China-US economic cooperation following the important consensus between the two state leaders, and the economic cooperation between the two countries progressed smoothly. China-US economic cooperation has made important and positive progress. In early May, the two sides reaped a series of early harvests. At present, the two sides are conducting consultation on the follow-up outcomes of the 100-Day Action Plan with the expectation for more practical outcomes. We hope the US can work with the Chinese side for the success of the upcoming first round of China-US Comprehensive Economic Dialogue, further deepen our cooperation in economy and trade, and bring more tangible benefits and interests to the two countries and peoples. Follow-up: Can you be more specific in what you are expecting from the next week? Would there be any additional details for the plan? A: I will refer you to the relevant department if you are interested in more details. Follow-up: What is your response to the relevant criticism? A: Everyone bears witness to the degree of China's openness. We have been stressing that once opened, China's door of opening-up will never be closed. It will only open wider. Foreign investment in China on the whole has kept the trend of continuous increase, which speaks volume for the fact. Q: A US military source said that recently a Chinese navy vessel was operating in waters 100 miles off the coast of Alaska, allegedly a telecommunications and information-gathering vessel. Since this ship appeared there before the US tests the THAAD system in the relevant region, there is suspicion that this warship is engaging in relevant intelligence-gathering and observation. Can you confirm that? A: I'm not aware of this. I will refer you to the military if you're interested. Q: The Hong Kong Legislative Council invalidated its four members' oaths of office today. Will this move increase the international community's concern that Hong Kong's freedom is threatened by the central government? A: Hong Kong is China's Special Administrative Region, and Hong Kong's affairs are purely China's internal affairs. Your question on Hong Kong is not a diplomatic one, and I will refer you to the relevant authority. After the press conference, the following question was raised: According to media reports, the Japanese police in recent days found the bodies of two Chinese females, which were suspected to be the two recently missing Chinese nationals. Can you confirm that and tell the relevant information? Has the Chinese Ambassador to Japan provided consular assistance to the families of the missing ones? Geng Shuang said that, on the night of July 11, the Chinese Embassy in Japan received an emergency call from a Chinese national, whose two daughters went out of contact in Yokohama on July 6. After learning this information, the Embassy immediately launched the emergency mechanism to meet the Japanese police and other principals of relevant authorities, and required the Japanese side to make all-out efforts for search and inform the Chinese side of the latest development of the case in a timely manner. On July 14, after learning the recovering of two bodies suspected to be the missing Chinese nationals, the Chinese Embassy again contacted the Japanese policy urgently. At present, the Japanese police has confirmed that the two bodies are the two missing Chinese nationals who have been killed. We deeply mourn the passing of the two Chinese nationals, convey deep condolences to the bereaved families and strongly condemn the cruelties of the perpetrator. The Chinese Embassy in Japan has required the Japanese side to spare no effort to solve the case, seize and strictly punish the perpetrator and uphold justice for the victims and their bereaved families. The Chinese Embassy in Japan will continue to closely follow the development of the case and actively provide assistance for the families to handle the follow-up affairs in Japan.